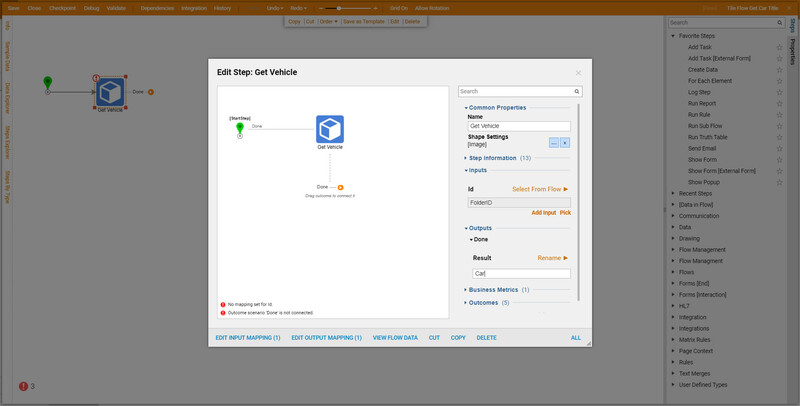 Portal pages can display dynamic page content with the use of Tile components. Tiles can be placed on any portal page, but the content for each tile must generated by a flow. To display dynamic content, create a flow the outputs a Tile Return data object containing the content you would like to display. In the Page Designer, place a Tile component that corresponds to the type of Tile generated by your flow, then configure the Tile component to listen to your flow. In this example, we will replace the folder header data component of a Car folder&apos;s Alternative View with a more succinct Tile display. Begin by creating the flow which will populate the Tile. 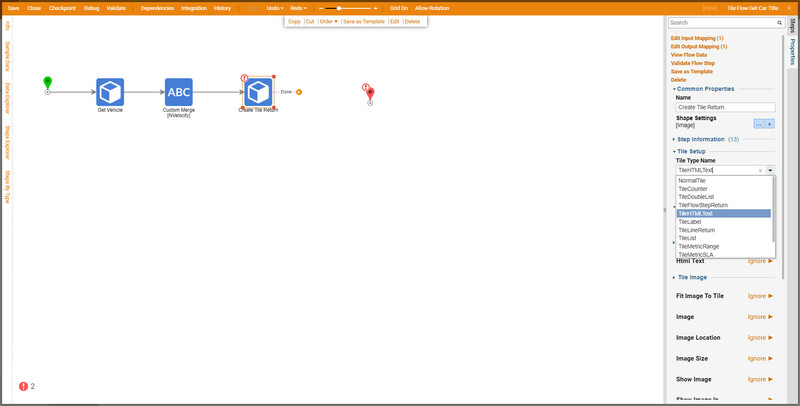 Navigate to a Designer folder and select the Create Flow	button. In the resulting New Flow	dialog, name the flow and select CREATE	. 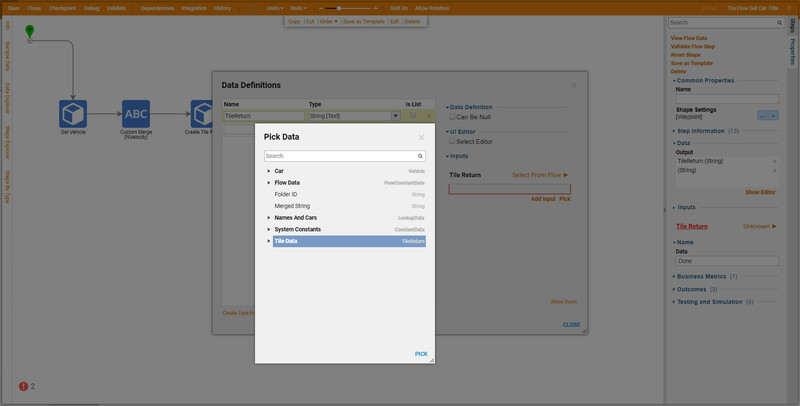 To get our Car data, this flow must be provided with the FolderId of the Car folder. When our Tile component uses this flow, it will provide the FolderId for us, but our flow must be configured to accept it. 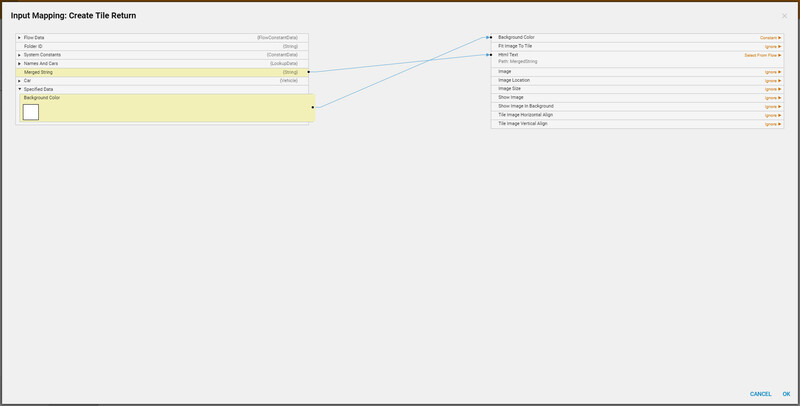 For this reason, we will begin by defining a flow input called FolderId	with a type of String	, and then click Save	. Next, we will use this FolderId to get the details of the Car folder. 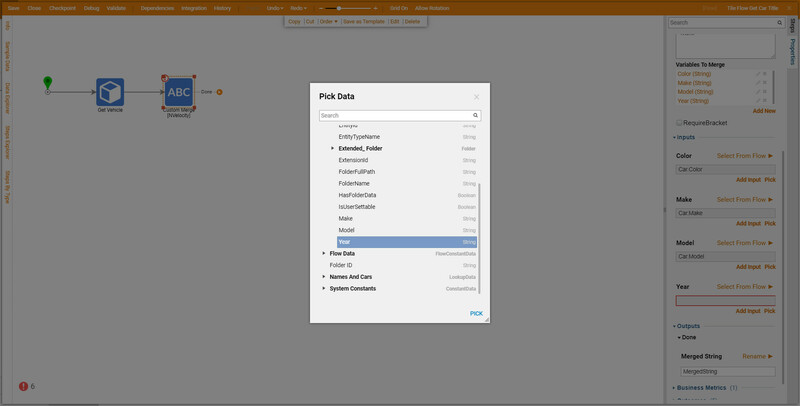 We will find the Get Car	component in the Toolbox tab, under the category My	Integration > User Defined Types > Folder Extensions > Vehicle	. For the Get Car	component, we will map FolderId	to Id	and rename the output to "Car". 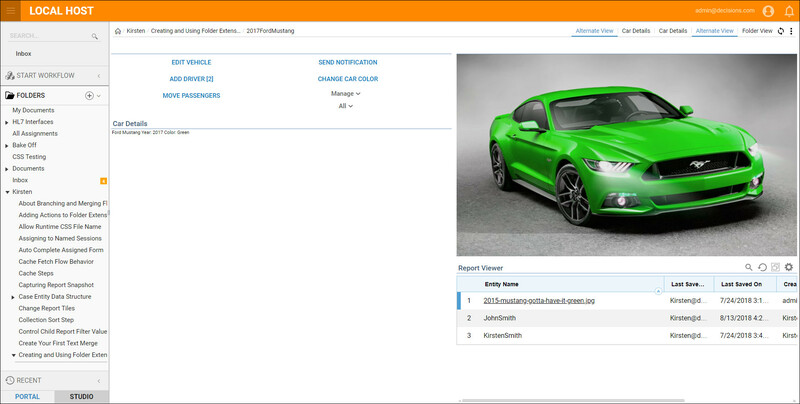 Next, we will turn the details of our Car folder into HTML for display in our Tile. For this, we will use the Custom Merge [NVelocity]	component. 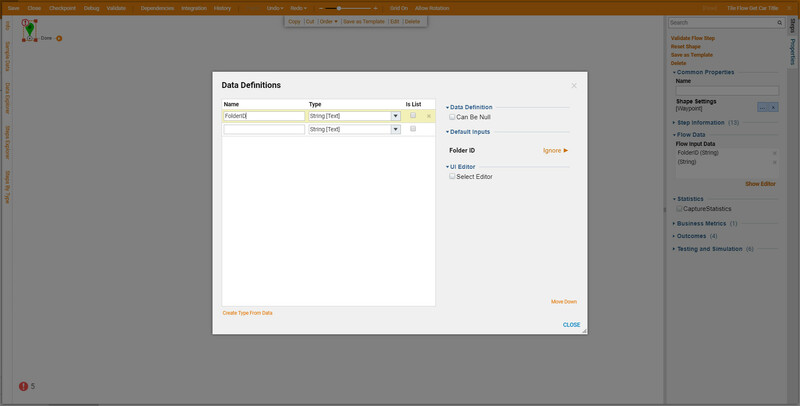 It can be found in the Toolbox tab, under the category Data > Text	. In the Properties tab, we will define the inputs used by the Custom Merge [NVelocity]	component. In the Merge Setup > Template	field, we will type the HTML content of our Tile, using $FieldName syntax to define the dynamic variables in our Tile. Once we&apos;ve written our HTML, the Custom Merge [NVelocty]	component will detect the dynamic variables in our template and create inputs into which we&apos;ll map our Car&apos;s data. 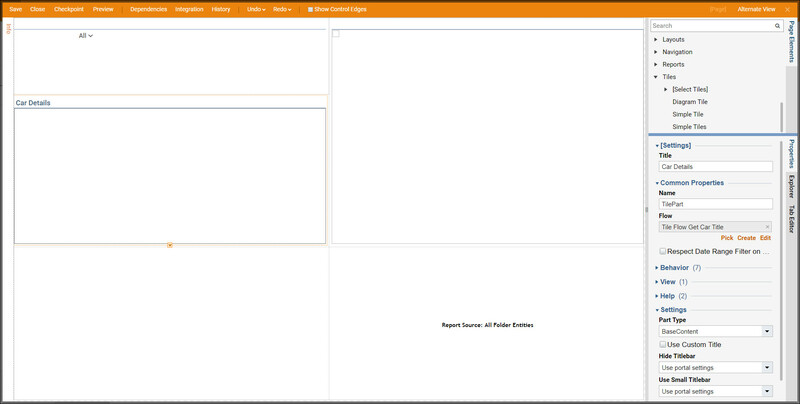 In the Mapping Editor, we will map the properties of our Car folder to the respective fields in our template. Next we will turn the HTML we&apos;ve generated into a TileReturn object. 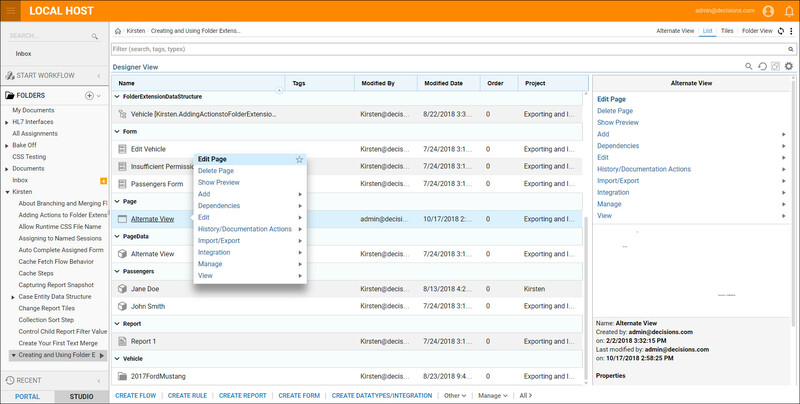 We will find the Create Tile Return	component in the Toolbox tab, under the category Communication > Dashboards	. In the Tile Setup	section of the Properties tab, we will set Tile Type Name	to TileHTMLText	. In the Mapping Editor, we will set the background color of our tile to white by setting the Color	field&apos;s mapping to type to Constant and selecting white in the Value	selector. We will define the HTML content of our tile by mapping MergedString	to HtmlText	. In the end, we want this flow to output a TileReturn object for use in our portal page, so we will select the End Step	and define an Output called "TileReturn" with a type of TileReturn	. We will map the TileData	output from our Create Tile Return	component to the TileReturn	output. This will complete our flow, so we will save it and close the Flow Designer. Next, we will display the output of our Get Car Tile flow. We will navigate to the location of our portal page: System > Common Data Elements > Folder Behavior Actions > Transportation.CarFolderBehavior	. 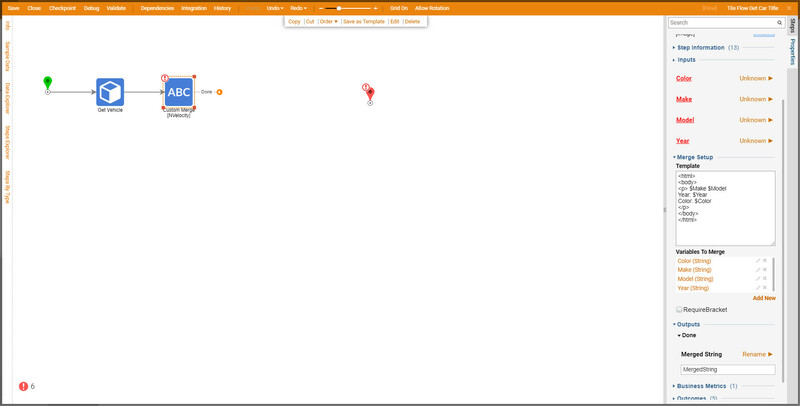 Select the Alternate View	page and chose the Edit	link to open it in the Page Designer. Add a Simple Tile to the page , under the categoryTiles	. Define the flow which provides the content for our Tile. In the Flow	section of the Properties tab, select Tile Flow	Get Car Tile	. This completes the changes to the Alternate View page, save it and close the Page Designer . Navigate back to the Car folder and select the Alternate View, view the HTML displayed in a Tile under Car Details.